Bathroom Blogfest, now in its seventh year, draws attention to the customer experience through blog articles and social media content published over five days, from October 29 through November 2, 2012. This year’s event also includes a Twitter chat on Wednesday, October 31, via #KBTribeChat. In honor of October being Breast Cancer Awareness Month, #KBTribeChat will focus on generating ideas for reinventing the bathroom experience while bringing new meaning to life for cancer survivors. And now, onto the topic of ceramic tile and nature! 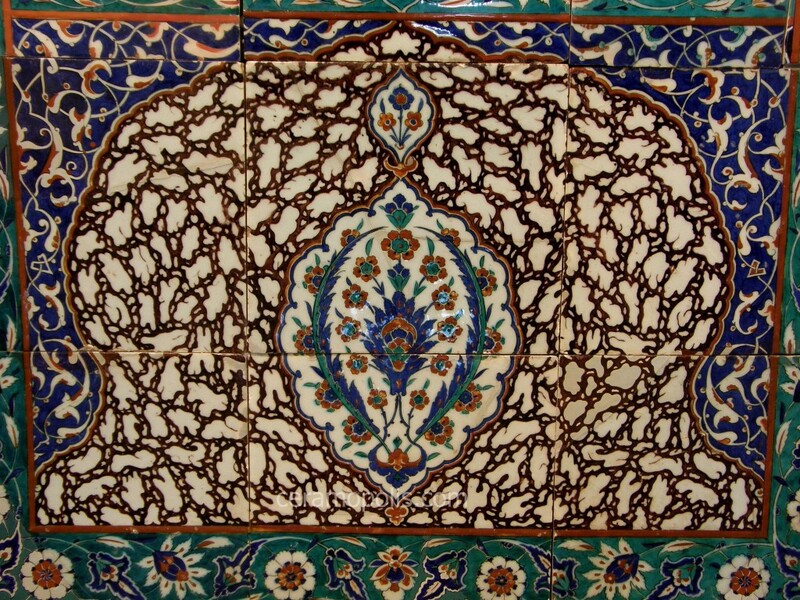 Ceramic tile has been a part of building history for centuries. According to the American Ceramic Society, the first discovered instance of ceramic figurines used for ceremonial purposes occurred in 24,000 B.C. Naturally, over time, this material with its new found purpose led to the production of ceramic tile back in 14,000 B.C. in Mesopotamia and India. As the centuries passed and previously thought impossibilities fell to the wayside, ceramic tile has evolved from being an embellishment to masonry and brickwork, to that of a long-lasting, multi-purpose, and flexible necessity. Adorning floors, walls, façades, and ceilings, ceramic tile has brought forth ongoing vibrant beauty and enlightenment to historical buildings of worship that still stand today. I believe it can easily be said that ceramic tile has served as a testament to time. Various shapes and sizes of white and green ceramic tiles used throughout Teruel, Spain. (12th-13th centuries). 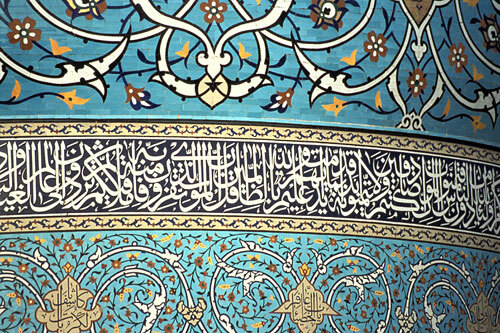 Detail of intricate tile work on mosque dome, Yazd. Image via Sacred Sites. Thanks to the multitude of technological advancements available, such as ink-jet technology, ultra-thin slabs, nature-mimicking designs and patterns, ceramic tile has become a chameleon of the building and decorating industries with its inherit ability to adapt. History has proven ceramic tile has climbed out of the bathroom! So how does this help you elevate the customer experience? It’s simple, really. Keep yourself abreast of what’s available globally by attending international shows, such as Coverings, Cersaie, Cevisama, Expo Resvestir, and many more. With your experience and knowledge, coupled with your customer’s quest for information, a positive and memorable customer service experience is guaranteed. Bathroom Blogfest brings together 18 bloggers and blogs from the U.S., Canada, Dubai and the UK. Between October 29 and November 2, these experts in marketing, customer experience and service, public relations, home and interior design, life, retail, building materials and flooring will call attention to improving the overall bathroom experience for end users via the blog articles they publish. For more information about Bathroom Blogfest, visit BathroomBlogfest.com, follow along on Twitter as @BathroomBlogfes (look for the hashtag #BathroomEXP), or "Like" Bathroom Blogfest on Facebook. You can also contact Whittemore via email at: cbwhittemore@SimpleMarketingNow.com. #KBTribeChat is a weekly Twitter discussion for kitchen and bath industry companies and professionals which takes place Wednesdays, from 2pm to 3pm EST. For Bathroom Blogfest 2012, Nora DePalma, principal, O’Reilly-DePalma, and Whittemore will co-host #KBTribechat. This week’s edition will focus on reinventing the bathroom experience in homes and buildings to bring new meaning to life for cancer survivors "still climbing out." 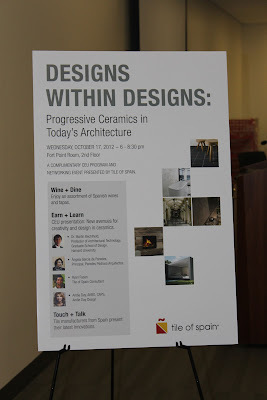 This past week I attended an event in Boston that was hosted by Tile of Spain which showed the advances that have been made in ceramic tile. At this event, there was also an opportunity to gain a CEU credit but I was interested in learning more about the possibilities and innovations that were coming along and how they related to architecture. Ceramic tile has some unique changes coming along the way due to advances in technology that make things possible that just a few years ago would have been science fiction. One of these advances is the use of ink jet printers. Is it wood or tile? 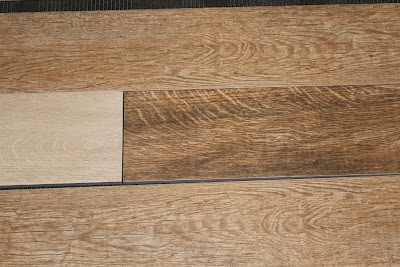 Now just by looking at the photo above, can you tell if this is ceramic tile or real wood? You probably guessed by this article that it is tile but look at what can be done now. 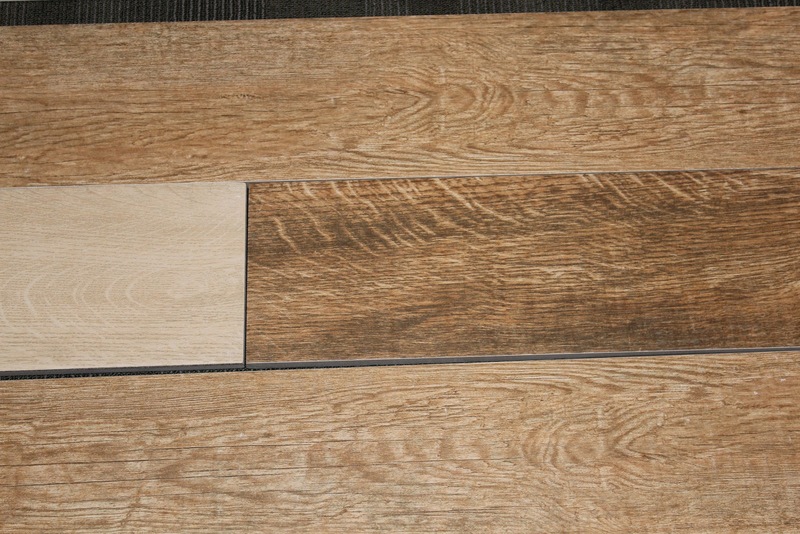 We can now have a product that looks like wood but wears like tile. 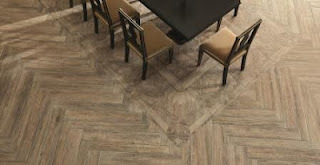 These industrial printers can be used for many types of tile and are not limited to only wood patterns. One of the manufacturer's stated that certain tile that they made could be placed in high traffic lobbies and still retain it's appearance for over 20 years or more. That's value! Events such as these further our thinking and here Ryan Fasan, is speaking about the advances that have been made with the ceramic tile industry. Have you heard about ceramic tile that can be feel cool on a hot day yet be warm to the touch on cooler days? It's real and will be coming to market soon. No more saying that tile won't work in the bedroom because you don't like the feel of cold tile when you get up. 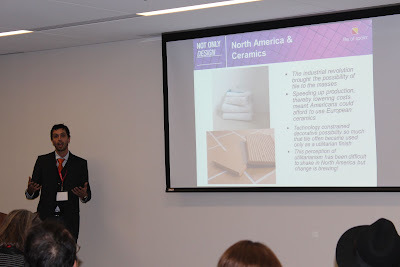 There were also discussions on how ceramic tile can be used to create green spaces on buildings by providing shading as well as by being aesthetically pleasing to the viewer of the structure. Ceramic tile also offers an ecological long term choice over other materials in it's ability to withstand the elements and still look great over time. A modern building using ceramic tile to provide a stylish exterior using sheets that are larger than previously thought possible. Another area that will be seeing expansion is the use of robotics in 3D tile production as a way to create varying textures that couldn't be duplicated before and some wonderful possibilities for mosaics. 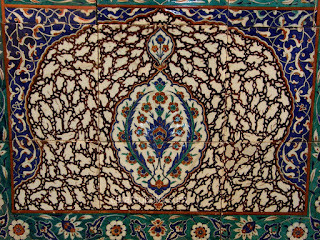 Presently work is being done with robots to read a design and create the pattern with tile through advanced computer programs. All of these are in the beginning stages but lead you to wonder what will be possible in the future. Where could they be used? How will my project stand apart from the others? We will be seeing pieces that are thinner and larger with so many possible uses. What about sheets that are 3' x 10' in size? Larger pieces with various textures and designs that reflect the light in new ways to add stunning visual appeal. Another advancement that we will probably seeing is more customization in tile. The photo below is made from a picture and that picture is then set onto the tile using ink jet printers. Here there are many individual tiles that are combined to make a total picture. A photo this large would be great for a commercial project but what about sending a photo to a company of a flower scene or something that you personally wanted for a black splash or shower and having that printed up on tile. You would have a totally custom installation and this technology already exists and is just a matter of time before it is affordable to a larger audience. One use of inkjet printers on a large scale piece. Individual customization for the retail trade can't be far behind. What possible innovations would you like to see in the future? How would you use them in a future project? Will they be ecological and appealing? Every day the possibilities grow! Using cement tile to incorporate a decorative element into any room or indoor/outdoor space is an attention-getting idea and design element. In this powder room, just a few cement tile are used to make a luxurious octagonal tile rug near the vanity. Cement tiles work well with stone to create a focal point that draws your attention to the space, while adding color and interest, such as the cement tile rug created in this master bathroom using two of our tile patterns: Sosua and Geometric 10. For a more modern design, we suggest combining geometric borders together with traditional patterns. But don't let the creativity stop there! Be imaginative by fashioning borders with cut pieces of cement tile, or by alternating them with stone. Cement tiles are an ideal way to add further interest and design style when using large format tile in a room. Meet our newest line of cement tile: Fragments, tiny, tesserae that proudly carry a cement tile pedigree. 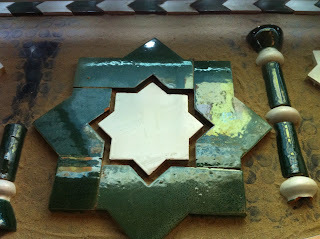 Fragments are another way to get creative with cement tile. Fragments is a colorful mosaic accent collection of patterned cement tile re-purposed from the cement tile factory. 's extras. Each piece, which is first cut into a square or rectangular tessera, is then carefully chosen on how its color and pattern will integrate with the theme of the mosaic. 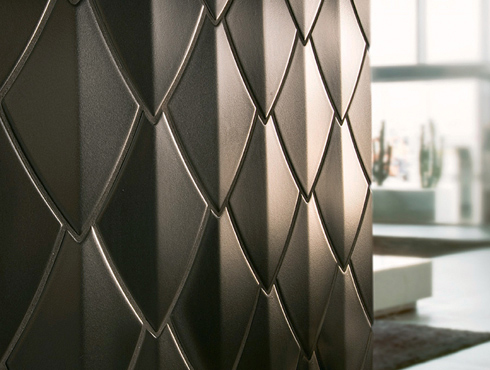 Fragments is designed for wall applications because the mosaic surface is not flat. With mismatched patterns, strong grout lines, and bold colors, it'.s a great choice for a contemporary kitchen, bath or accent wall. These mosaic tiles will look marvelous in a mid-Century remodel or modern home with clean lines and neutral palettes that need color. The small and large square formats are playful and fun for casual, contemporary living. Consider using the Bar Format in a more formal or traditional style since the narrow cuts provide a softer look with its blended pattern. Expect significant variation in samples and final orders because of the remnant tiles, patterns and colors used for each project will differ. This variation makes Fragments unique, and each installation one-of-a-kind. In addition to the four colorways available in the Fragments collections, there are also three design-friendly formats: Small Squares with 1.5" x 1.5" tesserae on a 12"x12" sheet; Large Squares with 2"x2" tesserae on a 12"x12" sheet; and a Mosaic Bar with 3/8" x 7-3/4" tesserae on a 12"x18" sheet. When laying ceramic field tile for wall applications, match the grout lines or tile layout to the style of your house. Contemporary installations usually look better if clean lines are maintained. For instance, on a backsplash for a contemporary home, place 3"x6" subway tiles on a grid layout. However, the backsplash for a Spanish Revival or California Bungalow will generally look better on a grid or brick layout. Remember, this is just a rule of thumb. At the end of the day, the design should be the one that speaks to you! Once again, Avente Tile is excited to participate in Bathroom Blogfest 2012 the last week of October. We have been involved in this event for three years. 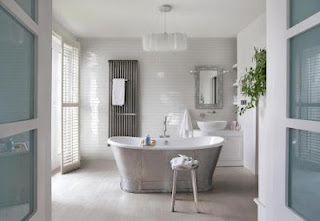 Through blogs, you can gain great perspective on bathroom and how to create a better experience. You don't have to blog to participate, just read, learn and share. This is a fun way to share and learn. We will post at least one article and focus on the customer experience and bathrooms. Who doesn't want a better bathroom experience? Look for our special post the last week of October. We'll be sharing what we find on Twitter and Facebook. Many thanks to Christine B. Whittemore as the annual event'.s coordinator. She is the Chief Simplifier of Simple Marketing Now, LLC. Also look for our monthly blog contributor, Arpi Nalbandian, on the roster of Bathroom Blogfest participants. Arpi is an editor, writer, and founder of Tileometry. You'.ll find her contributions on Avente Tile Talk. 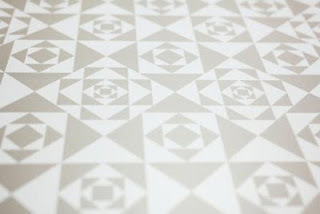 Meet our newest line of cement tile: Fragments! It's pretty easy to see that these tiny, tesserae have cement tile pedigree. Fragments are colorful mosaic accent strips made from patterned cement tile that have been cut. Fragments begin as cement tile factory extras that are cut into square or rectangular pieces. Each tessera is carefully chosen based on how it's color and pattern will integrate with the theme of the mosaic. Use Fragments as an accent strips for a wall or bascksplash. They work well running behind a kitchen counter with other tile or can be grouped and framed to create a focal point for a larger backsplash. Fragments come in four colorways: spring, summer, fall and winter. The sheets are face tape mounted for easy installations. While holding true to the general color tone or feel, there will be significant variation in samples and final orders because remnant cement tiles are used. The tiles, patterns and colors used for each project will be unique and different. It is this variation that make the product so unique and each installation is truly one of a kind. 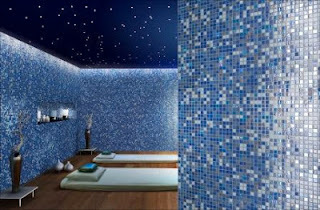 Fragments are designed for wall applications because the mosaic surface is not flat. With mismatched patterns, strong grout lines, and bold colors, Fragments are a great choice for a contemporary kitchen, bath or accent wall. These tiles will look marvelous in a mid-Century remodel or modern home with clean lines and neutral palette that needs color. The small and large square formats are playful and fun for casual and contemporary living. Consider using the Bar Format in a more formal or traditional style since the narrow cuts provide a softer look by blending the pattern. 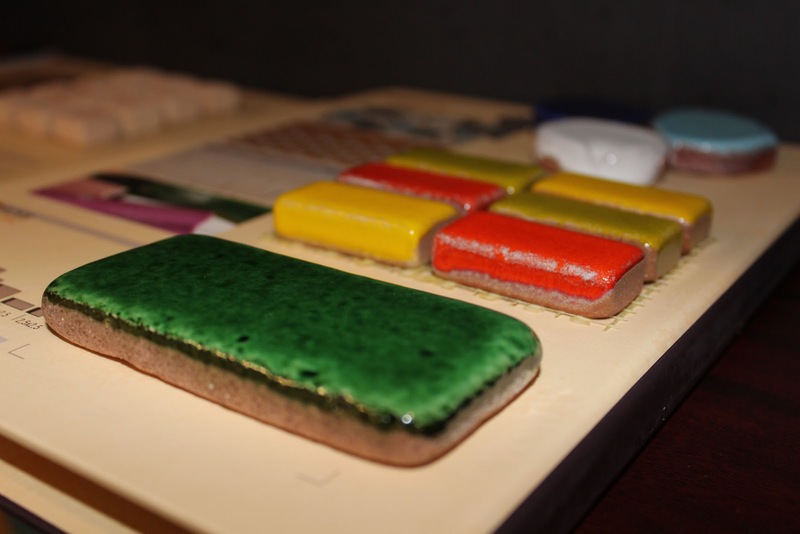 Allow about six to eight weeks for the manufacture and delivery of your mosaic. 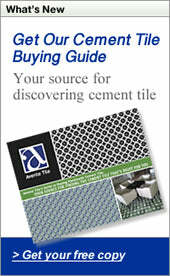 These items can be ordered by contacting Avente Tile. Currently, many designs of our Fragments Cement Tile Mosaic accents are available online. Look for the complete collection to be available online soon. Where would you use fragments? Bars along the kitchen counter or small squares as a focal point for an entry wall? Would you use one color, like autumn, or several? If you have questions about this product or would like to consider it in your next project, please contact Avente Tile or view our product catalog of Fragments Cement Tile Mosaic Accents. We'll be glad to help! With the close of the 30th edition of Cersaie, the International Exhibition of Ceramics for Architecture and Bathroom Furnishings held annually in Bologna, Italy, once again proved itself as the launching pad for newly developed ceramic, porcelain, glass and mosaic tile products that will soon hit showrooms and the marketplace. Boasting more than 900 exhibitors from all corners of the globe, and 176,000 square meters (577,428 square feet) of exhibition space, Cersaie is a not-to-be missed event for distributors, retailers, interior designers, architects and installers. 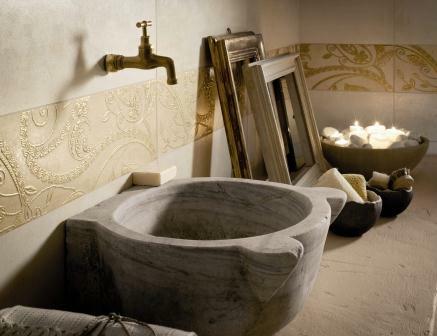 The latest trends for Italian ceramics include nature-inspired materials, a rediscovery of terracotta, monolithic tiles, textures, and cutting-edge design that remains environmentally conscious. In terms of colors, powdery tones from grey-blue and clay, to mauve and lavender seemed popular, as did warm greys and ivory, clay and jade. Italian manufacturers have also seemed to embrace the warmth and appeal of terracotta. Combined with modern shapes, new colors and up-to-date finishes, terracotta has been revived with a fresh, modern image. 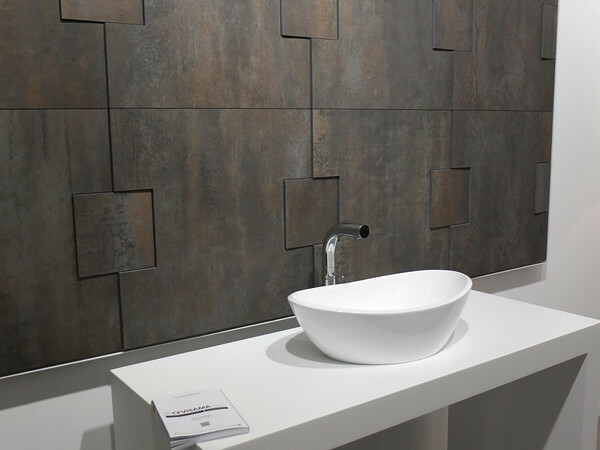 Gaining popularity in the architecture and design fields are cement and resin, so it’s befitting that these modern, industrial, and high-impact finishes have been reinterpreted by Italian ceramic tile manufacturers in various ways. Not to be outdone are reproductions of wood grains, or the rich veining and shading found in natural stone. However, perfection is only one aspect of these trends. Mismatched patterns and irregularity is another facet. 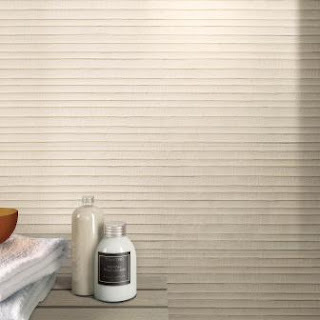 Imperfections such as surface-skimming cracks, and the faithful reproduction of river pebbles, added to the textural mix available at Cersaie. Thin, monolithic tiles have also found their place in the industry in both outdoor and indoor environments, as has the need to practice good environmental stewardship. An increasing amount of manufacturers now reincorporate their processing waste back into the production process, while others use recycled glass from screens or monitors from obsolete PCs previously destined for landfills. Let’s take a brief look now at the latest Italian tile products unveiled during Cersaie 2012. 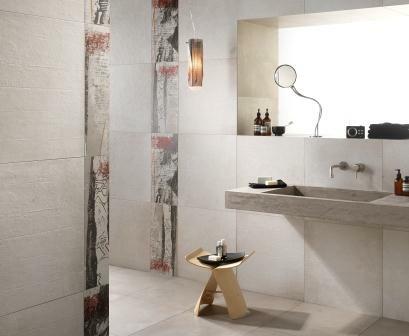 Designers and architects have unleashed their creativity with tile with several new collections made specifically for Italian tile manufacturers. Minoo – Ornate 8"x8" porcelain floor tiles designed by Marcel Wanders, reminiscent of Persian rugs. Available in 5 decorative patterns and 8 colors, silkscreen printed on a matte background. Designed by Marcel Wanders, Bardelli's Minoo is reminiscent of Persian rugs. Starck Collection – Designer and architect Philippe Starck has collaborated with Sant’Agostino to create “Flexible Architecture,” a new collection of ceramic tile that offers designers, interior designers and architects the ability to offer new possibilities where tile is no longer decorative, rather, it becomes part of the architecture, according to Starck. With the popularity of concrete and cement floors gaining ground among designers and architects, Italian tile manufacturers are offering products that mimic the look and texture of these finishes. 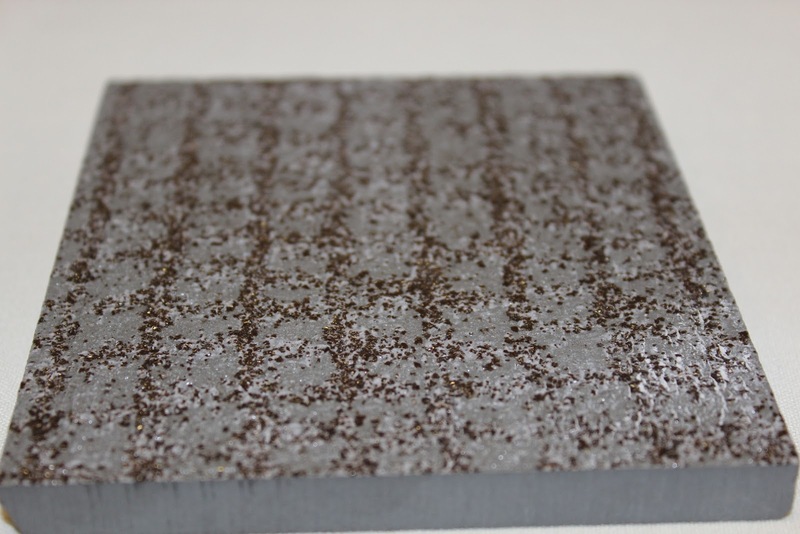 Gate Mark – A new textured surface for indoor and outdoor applications with a special anti-slip surface (coefficient R11 A+B). Inspired by board-formed concrete, it’s available in a range of neutral colors (Jet Black, Tube, Downtown, Breath, Broadway, Greige and Licorice) and two sizes, 24”x24” and 12”x24”. Also available in a natural or honed finish. Gate Mark by Caesar is inspired by board-formed concrete. 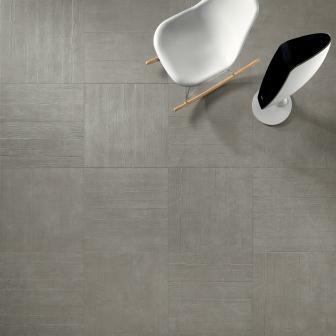 Urban Concrete – Colored-body porcelain tile for interior floors & walls. It comes in 6 colors, 4 sizes (24”x24”, 12”x24”, 16”x32”, 6”x24”) and two finishes. The Natural finish enhances the delicate colors and deep shades of the collection to imbue spaces with a sense of sophisticated neutrality. Meanwhile, the Frame finish reproduces the wood textures imprinted on concrete by formwork, lending dynamism and personality to interiors. A range of graffiti and floral decors complete the line. Flaviker's Urban Concrete reproduces the wood textures imprinted on concrete by formwork. Nextra – Porcelain stoneware collection that captures the density of cement, expressing all of its strength and unprecedented smoothness. The five colors of the collection are available in a natural or polished finish and can be used in both residential and commercial environments. It is made with 40% recycled content and comes in 4 sizes (18”x18”, 12”24”, 24”x24” and 32”x32”). Monocibec's Nextra collection captures the density of cement. An artist with a full palette is limitless in their creations. The same holds true for these Italian tile manufacturers who have utilized ink jet technology to much success. 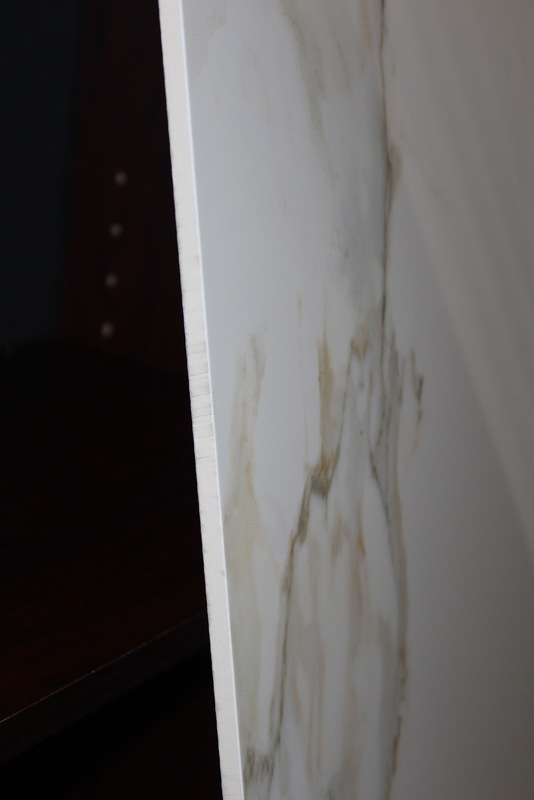 Headline – A digital glazed porcelain tile that’s made in the U.S. The collection is characterized by harmonious graphics, elegant veining and unusual shades of color to renew the mood of residential and commercial spaces. Available in 6 sizes and 4 colors using Ink Jet technology, the end result is a surface that boasts high-definition design. Signum – Porcelain tiles for floor and wall, residential, outdoor and light traffic areas; uses digital HD printing (up to 100 different graphics) unpolished/rectified in 2 sizes (9”x36” and 6”x36”) and 4 colors (Larice Sbiancato, Rovere Grigio, Olmo Selvatico and Palissandro Brasil); two geometric decors. Silvis – A collection of full-body porcelain stoneware inspired by four unique types of wood (Humus, Cortex, Candeo and Robur) and made of 40% pre-consumer recycled content. It has incredible richness and variety of veins thanks to high definition inkjet printing based on 40 accurately selected patterns. Available in two sizes (6”x48” and 6”48”) and two finishes: Classic, with a more refined appeal and Country, which is more rustic. Silvis by Cotto d'Este is inspired by four unique types of wood. A new collaboration with mosaic artist Carlo Dal Bianco using 4mm thick glass mosaic. The new collection is lightweight, dynamic, modular, geometric and highly decorative. Mosaico+ collaborated with mosaic artist Carlo Dal Bianco for its latest collection. Maximum – Measuring 300x150cm (approximately 10' x 5'), Graniti Fiandre combines proven porcelain tile technology with new high-performances qualities: strength, lightness, flexibility, adaptability. With a thickness of only 6mm to 3mm, Maximum features a polished finish. Graniti Fiandre's Maximum is light, flexible and strong. 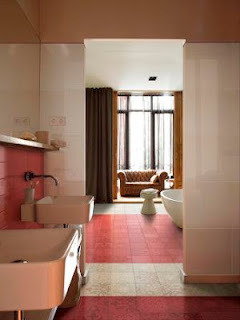 Convivium – A colored body porcelain tile for residential interior floors and walls. The collection combines numerous textures with 6 color options inspired by different natural surfaces (terracotta, stone and concrete) that can be used individually or in two-tone combinations. Available in 3 sizes with natural edges (12”x24”, 24”x24” and 16”x32”), 4 sizes with rectified edges (12”x24”, 24”x24”, 6”x24” and 12”x12” mosaic) and a wide range of accent tiles. 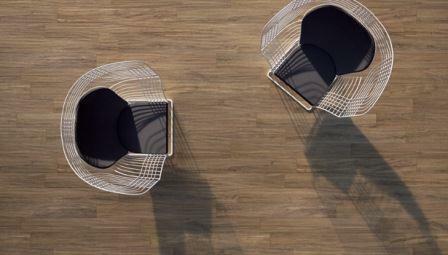 Convivum by Ariana is inspired by various natural surfaces. Frame – A new ceramic tile collection conceived by Studio FM that reinterprets traditional decorations (from the ancient Azulejos to Bauhaus). It features four compositions (carpet, geometric, weave and majolica) that have sophisticated “patchwork” effects. Frame by Rex reinterprets traditional decorations (from Azulejos to Bauhaus). Trend Stone – A colored-body porcelain tile available in a range of neutral colors (Charcoal, Cinder, Dove-Grey, Beige and Ivory), natural and honed finishes, square and rectangular sizes and a 12”x12” mosaic. Also comes with a range of decors (Damasco, Raku, Geo and Palace) and special pieces. Manufactured using 17% pre-consumer recycled content. 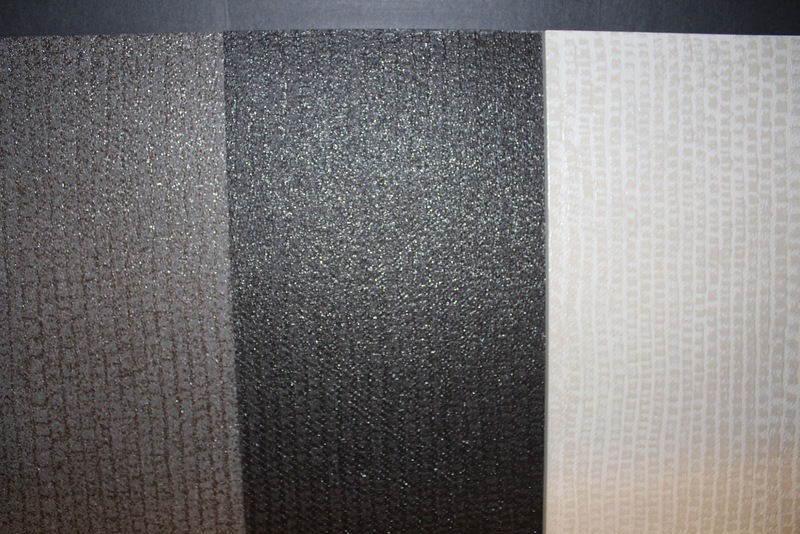 Trend Stone by Cedir offers a full range of neutral colors. 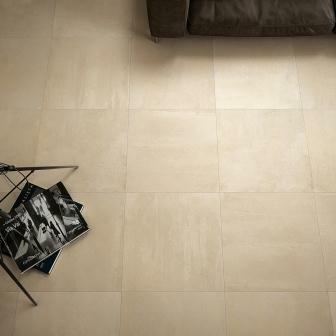 Claystone – Produces a feeling of extreme softness with neutral, almost pastel colors and the strong yet fluid grain. The surface – natural or polished – is also slightly textured, which amplifies the soft effect. 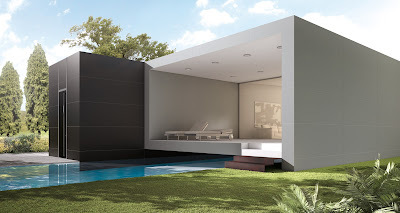 Available in 4 colors (Dark, Shadow, Ray and Desert) and a range of square and rectangular sizes. New Yorker – Pure white body wall tiles in size 4”x12” and a range of 7 dusty colors: matte white, bright white, taupe, caramel, smoke, charcoal, and night. The edges are straight for easy installation but the surface is slightly wavy, reminiscent of the classic subway tiles with a rich and soft glaze that gives nice shading effects. Settecento's New Yorker features a slightly wavy surface. 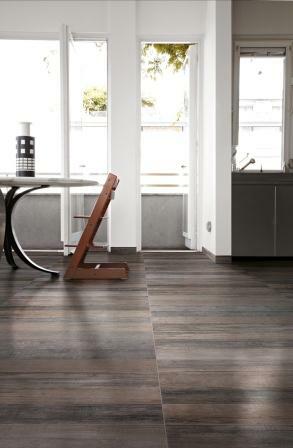 Arbor – A collection of sustainable, wood-inspired porcelain floor tiles for residential and commercial spaces. Made with 40% recycled material, it comes in 5 modern colors (white, black, brown, grey, beige) and 2 “plank” sizes (6”x39” and 4.8”x39”). Project – A collection of porcelain wall tiles where the concepts of wood and stone come together to create a whole new style. The range of 6 colors inspired by Leccese stone comes in 3 sizes (13”x13”, 13”x39” and 10”x24”) and can be combined with two 6”x39” oak-inspired tiles. The choice of materials and formats – all perfectly rectified and satin finished – creates endless design opportunities. Project by Naxos skillfully combines the look of wood and stone. Woodays – Porcelain tiles with 7 wood-mimicking looks – from Sycamore and Chestnut to Oak and Beech. 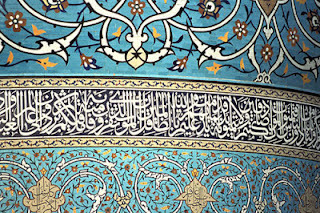 It’s available in a variety of sizes (as large as 24”x36” and as small as 3¼“x 36”), as well as a variety of trims and ornate compositions. Tagina's Woodays offers seven wood-mimicking options. Visit Cersaie for more information about the show, or visit Ceramic Tiles of Italy for related information about the Italian tile manufacturing industry.